While this site is filled with a lot of Japanese collectible toys, I’ve got some other merchandises that’s made in Japan and is of a little collectible value (to some). I’m talking about Japanese knives. Now I’m not a knife enthusiast, but I do like a sharp knife may it be on the cutting board for cooking, for craft, or any other things that I do with the help of a blade. And of course I wouldn’t mind if the knife also happens to look good. 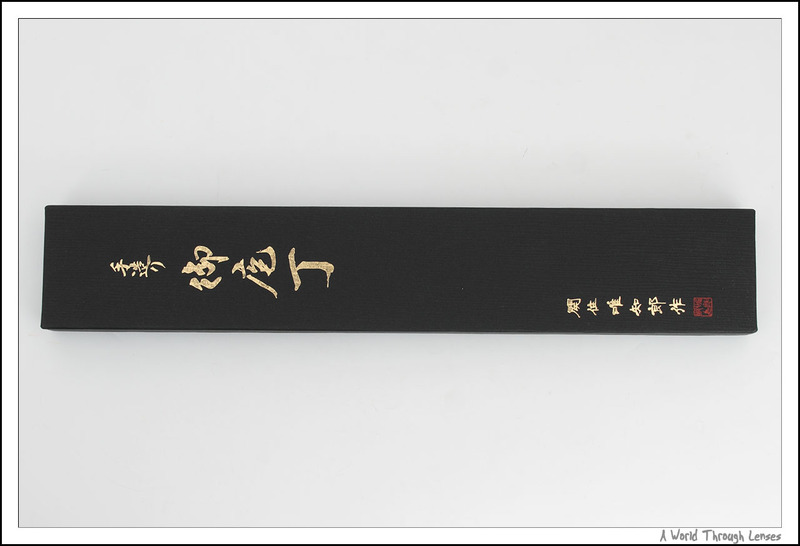 Why Japanese knives? Well because Japanese knives are harder and retains their edge sharpness better than your typical knives like Wusthof or Henckels from Germany. Although I think German manufacturers are playing catch up with their product lines and have recently introduced new products with features previously seen only in Japanese knives. But like I said, I’m not a knife enthusiast, so I just stick with what I know and what I know that works. The other reason why I choose Japanese knives is that these Japanese knives that I purchased are all hand made by relatively small blacksmiths. This makes me really appreciate the art of making knives by hand rather than machine stamped production from large manufacturers. And I’ve always appreciated fine craftsmanship. 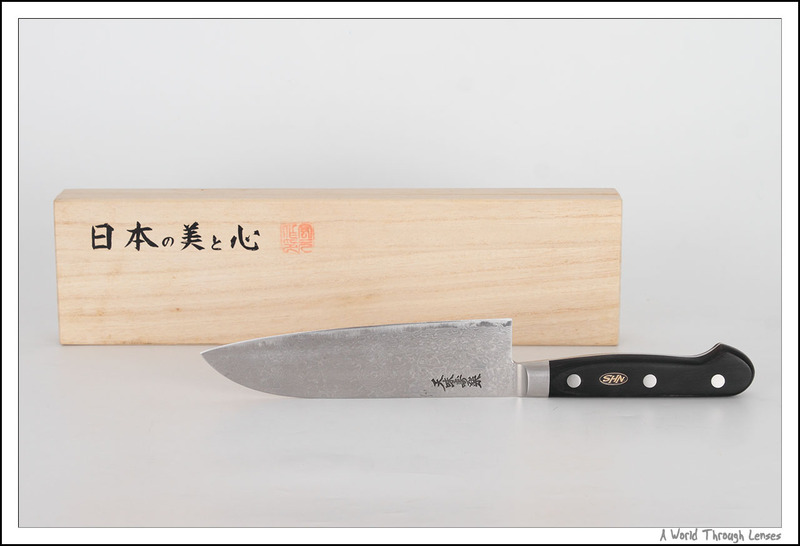 This first knife is a Tenmi-Jyuraku (天味寿楽) Damascus Santoku 180mm by Hiromoto. 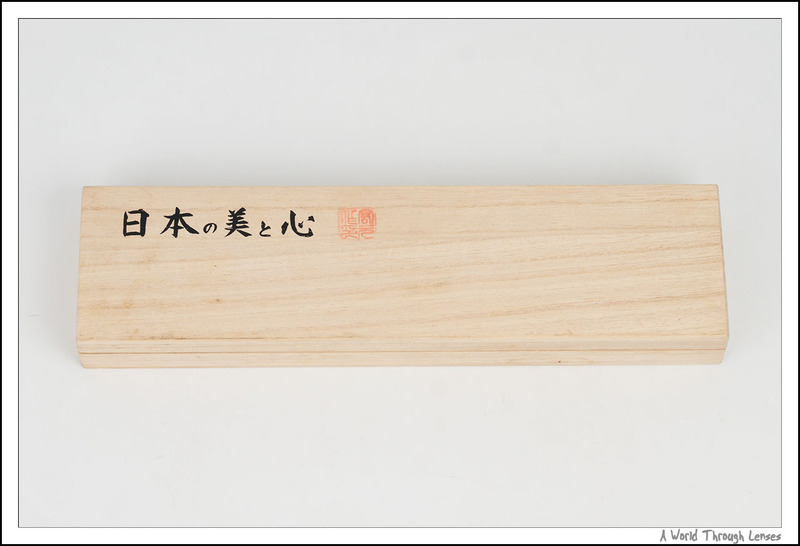 Santoku, or in Japanese 三徳 (loosely translated into Three Virtues), can be considered as a small version of the chef’s knife. I bought this one online from Japanese Chef’s Knife a long time ago. 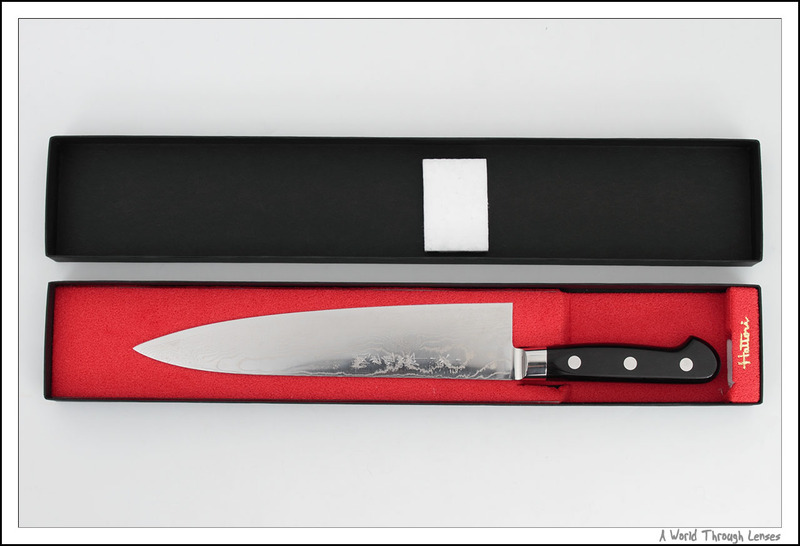 Today Japanese Chef’s Knife with their fast and cheap flat rate shipping service directly from Seki City – Japan’s knife capital, is still one of the places that I go to for Japanese knives. In fact I looked around in the local shops and on the Internet, buying from Japanese Chef’s Knife is still one of the cheapest and sometimes fastest way to get these Japanese knives. This knife has a VG10 cutting core with nickel Damascus stainless steel wrapped outside and a black Pakkawood handle secured by three rivets – a very classic design. Yes I know only the VG10 steel is responsible for the knife’s sharpness and the Damascus layers are just for decorations. But you can’t blame one for wanting a tool that works well and looks good at the same time. You can probably see all those grinding marks on the knife through the years of abuse that I’ve put this knife through. But all that aside, it is none the less still a very good knife to use and very pretty to look at. My only issue with the santoku is that Japanese santoku tends to be on the small side, this one has a 180mm blade length. It just feels a little too small and a little too light for me sometimes. Here’s the beautiful Damascus pattern on the knife. Hiromoto doesn’t disclose how many layers of steel is used to create the Damascus pattern, but from the complexity of the patter I’m sure there’re a LOT of layers. Now for a knife that I got more recently. 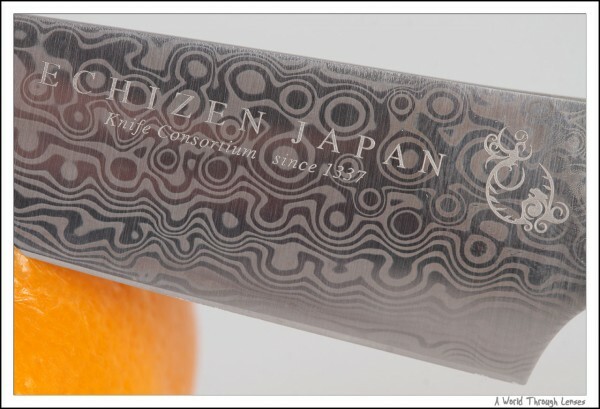 This is a Series 1310 Core-less Damascus Petty 105mm by Echizen Japan. Most Damascus knives out there are constructed the same way as my old santoku. Namely a hard steel core in the middle responsible for cutting, then the Damascus layers are added on the outside for the looks. Now this knife is different. It’s has a core-less design, they layered 70 layers of VG10 and VG2 steel together to form this blade, supposedly taking advantage of both form the steel. Is this design any good? I don’t have the slightest idea. But it was interesting design and I’ve never seen ones like this before. Since I wanted a new small knife for cutting fruits, I bought one to play around. The knife came in a very nice wood box. 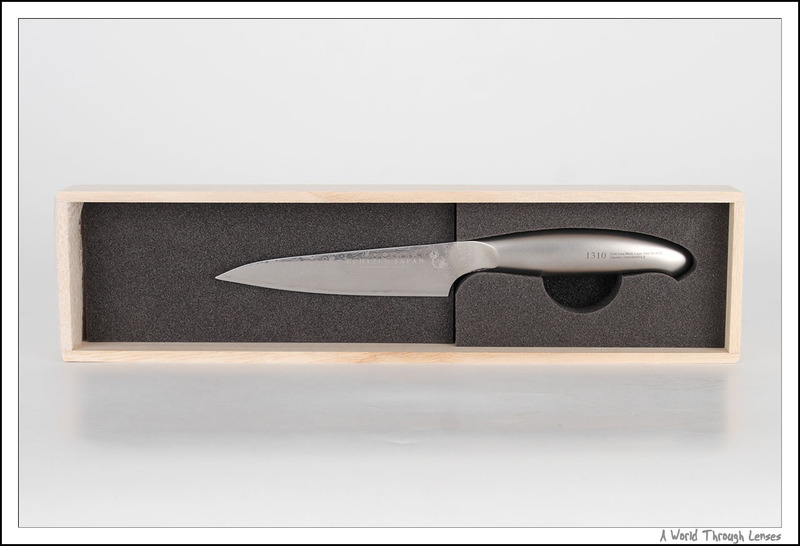 The knife is held in the shape cut foams inside the box. 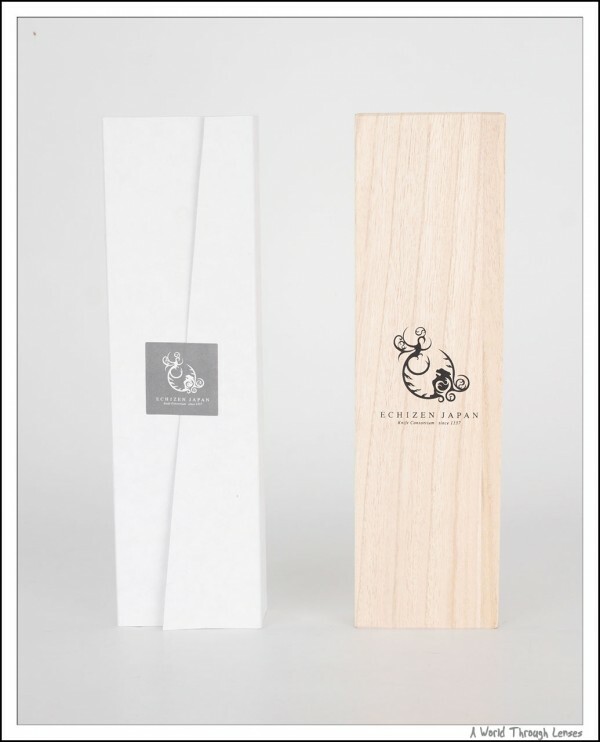 Nice traditional packaging outside and modern packaging inside. I like it already. The knife is actually very light. 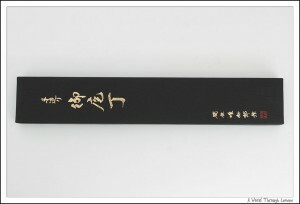 The 104mm length blade, 210mm long knife weights a mere 54g. 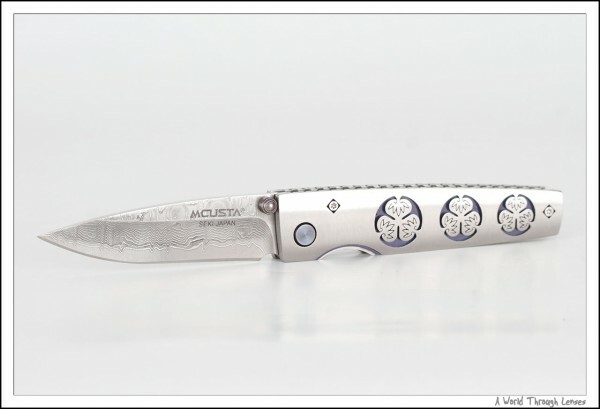 It has a very interesting design – a one piece hollow stainless steel grip gave it a really streamlined look. The Damascus patter actually goes right onto the tang which is a very nice job. It is definitely a gem to look at and very comfortable to use. Personally I like my chef’s knife to have a little weight in it. 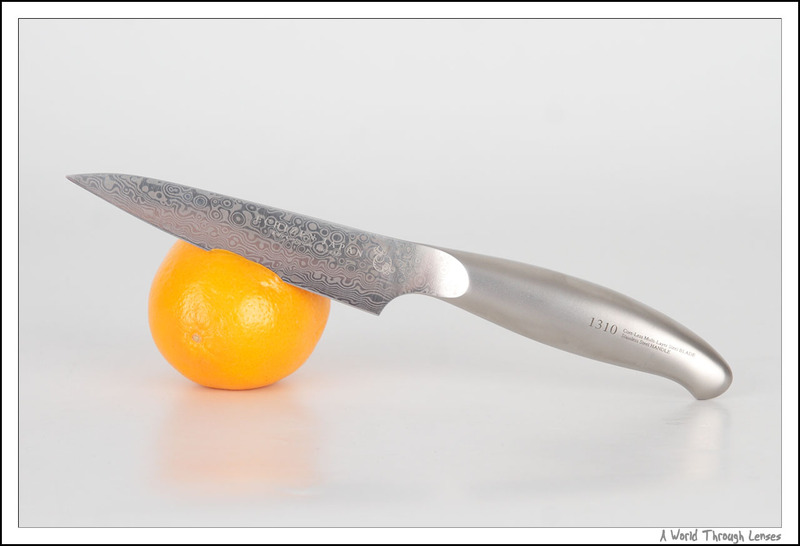 But for a fruit knife, a really light one is just fine by me. And here’s a close-up of the Damascus pattern. It’s unique and very pretty indeed. 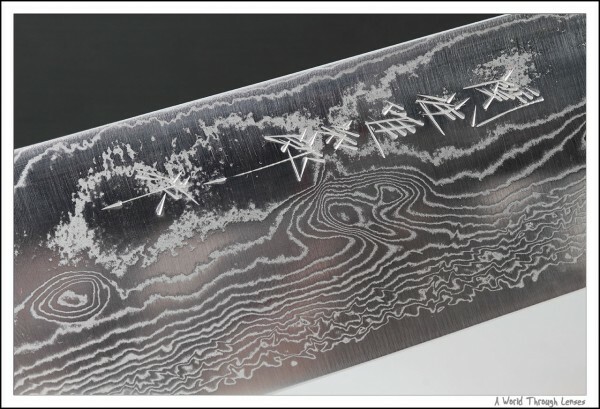 Looks a bit like water droplets and wave ripples imprinted on the blade. 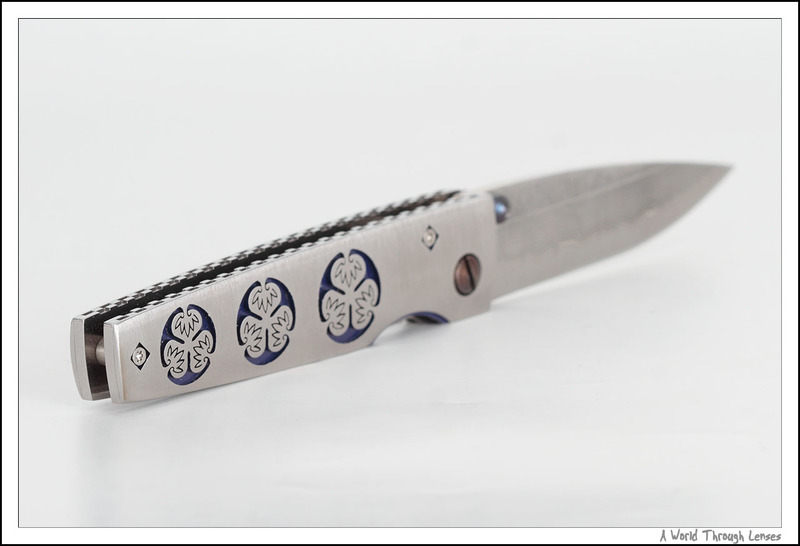 And keep in mind to make the pattern, it took 70 layers of steel on such a small knife. So it looks pretty but can it cut anything? Here’s a video of me slicing through some printer paper with this knife. I say it cuts very well, certainly better than my old Henckels. Now for something more substantial. 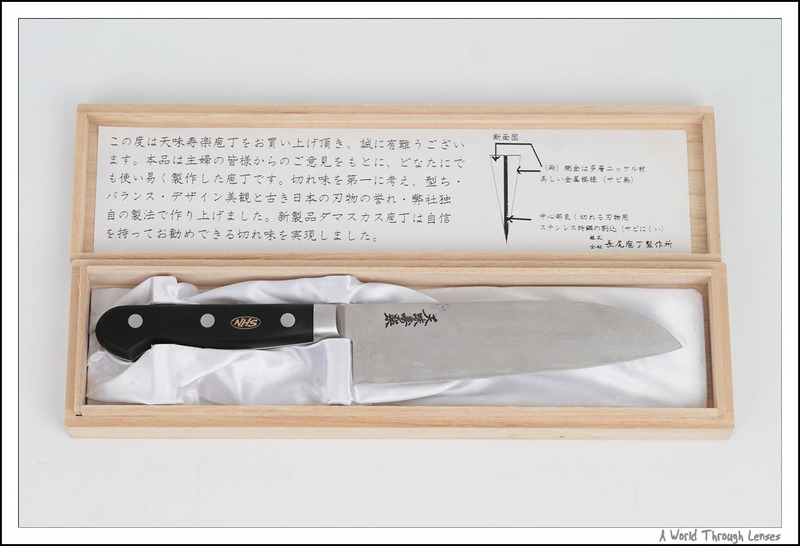 Gyuto, or in Japanese 牛刀 (loosely translated to Cow Knife), is probably the equivalence of the chef’s knife or French knife in western culinary terms. 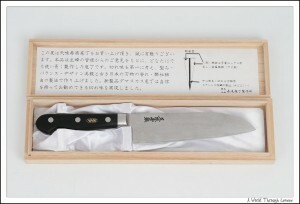 This is a HD-8 Gyuto 240mm by Hattori, which will be my main go-to knife for any cutting job in the kitchen. I’ve always wanted a slightly longer blade than my 180mm santoku and a little more weight in my knife, this one will fill in that role nicely. Here it is resting on a red pepper. It’s got a typical design of VG10 core for the cutting edge which is wrapped with 63 layers of nickel Damascus stainless steel and a black Pakkawood handle secured with three rivets. Here’s a close-up of the Damascus patter on the blade. 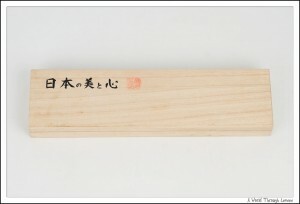 You can see Hattori Ichiro (服部唯知郎)’s name engraving on the knife. From the rough look of it, even the name engraving is not machine made. You can see the small tools marks on those long straight lines. So is this big fancy knife sharp? Yes, very sharp. Here’s a video of the same printer paper slicing test just like what I have done with the smaller petty knife. This last knife is not cooking related. Japanese Chef’s Knife also runs another web site called Japanese Knife Direct where they sell various of other Japanese knives like hunting knives, utility knives, etc. They charge $7 flat rate shipping for any number of knives you purchase on either of their web site combined. I always wanted a better folding knife than the ones I have now, so together with my cooking knives, I bought a small folding knife for everyday use. This is MC-9 Kamon Series Aoi by MCUSTA. Here’s the knife and the little protective pouch that it came with. 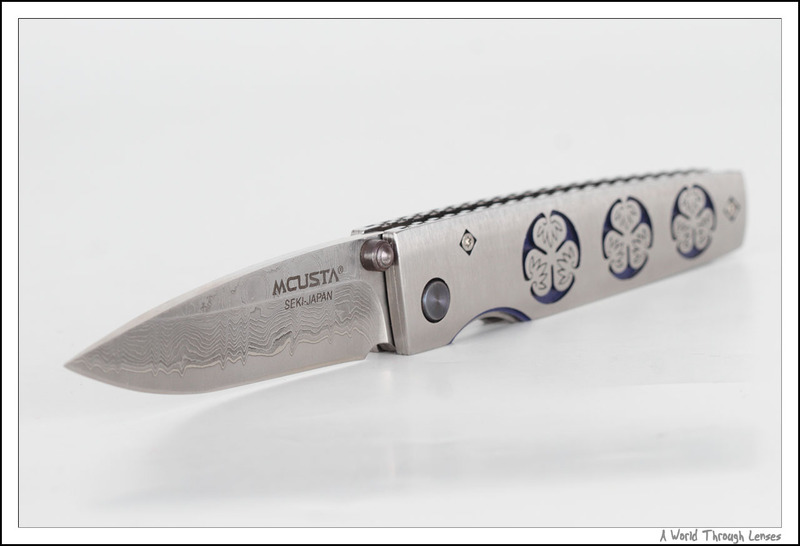 The knife’s handle is made of solid stainless steel with Kamon Aoi engraved on it. 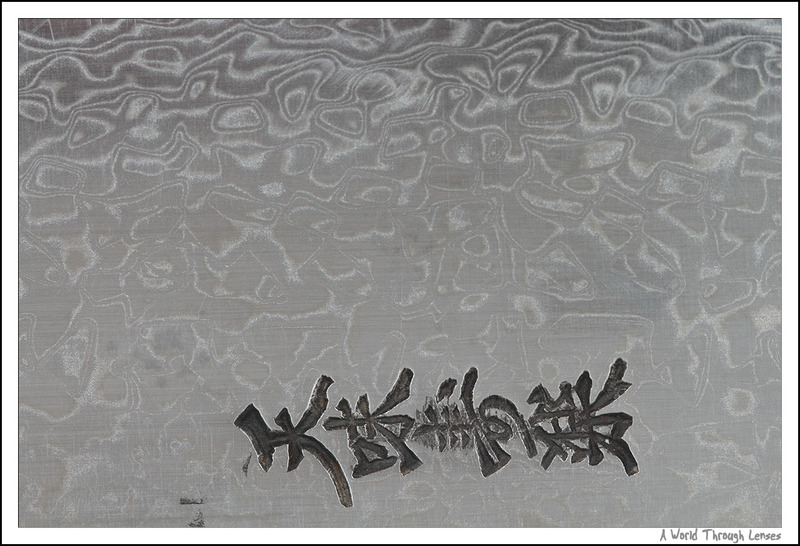 Kamon (家紋) means family crest which is a Japanese emblem used to identify the families. Aoi (葵) is the family crest of the Tokugawa (徳川) clan, which is a clan that had many shoguns that ruled Japan during the Sengoku period. While I had no interest in the Sengoku period nor Tokugawa clan, I just thought this pattern looked really nice. 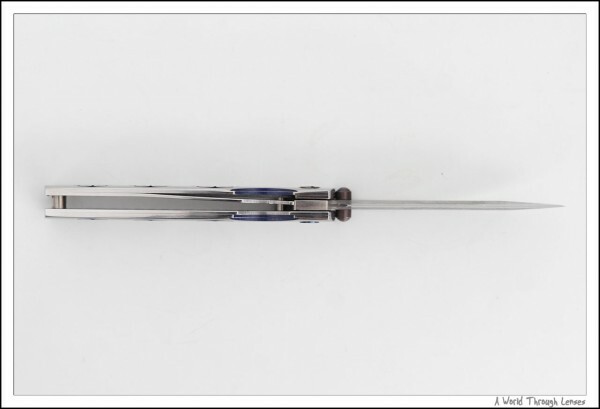 The knife folds to a length of 90mm. 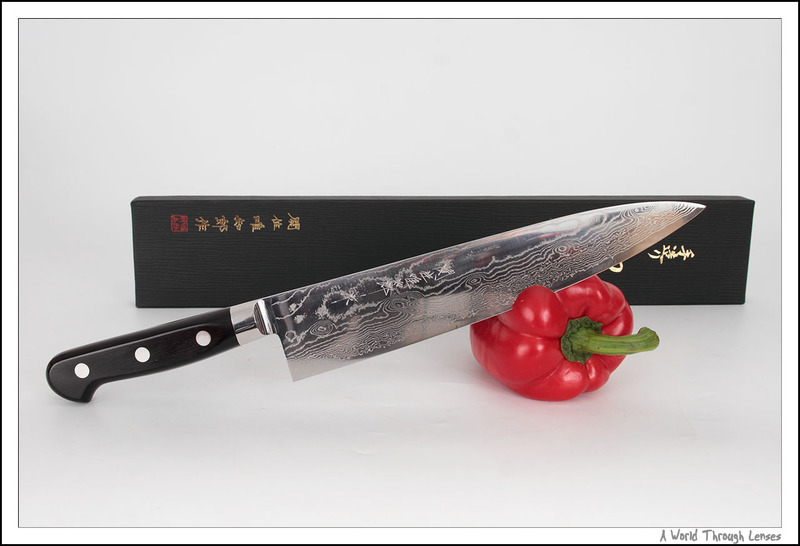 The blade is 70mm long and just like the chef’s knife, it has a VG10 core with 33 layers of nickel Damascus steel wrapped outside. 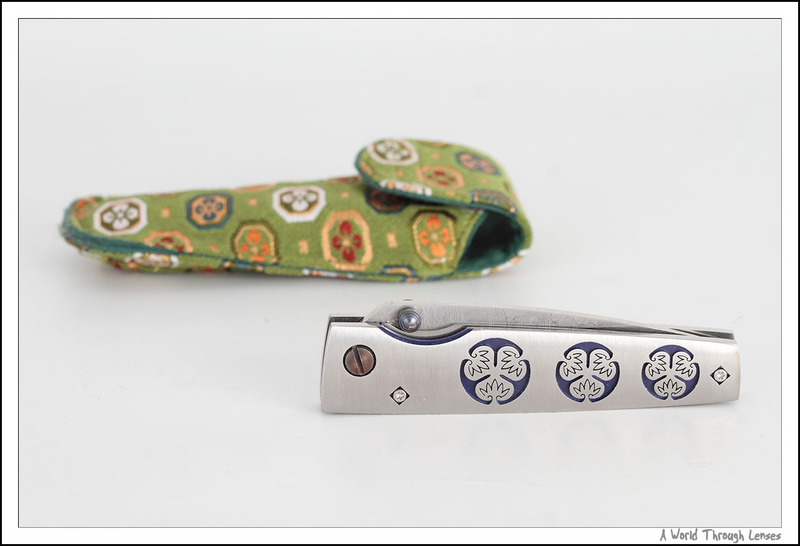 Here’s a better look at the Damascus pattern on the folding knife. These Japanese folding knives uses a very different mechanism for locking the blade in place than what I used to have. There’s no tension on the blade when it is being opened, and a piece of metal swing to the middle inside the handle to lock the blade in place after it is fully opened. This makes opening and closing the knife with one hand really easy. The knife opens and closes really smoothly and lock in place very nicely. We’ll just have to see after a few years of abuse, if this folding knife really holds up or not. Well I hope you like these different Japanese “collectibles”. I’m actually not really collecting them, I’m just buying them because I wanted some fine tools for cutting. And these really are fine tools not just for cutting, but for looking at too. I would like to know more about this fantastic knives.